In an unprecedented year of contentious politics, immigration has been one of the most high-profile, and controversial, topics to make headlines. 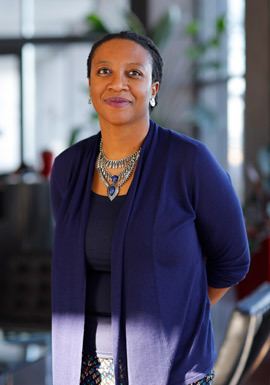 But the issues at play are ones that Uzoamaka Nzelibe, clinical associate professor of law and a staff attorney with the Children and Family Justice Center, deals with every day as she fights for youth who have been forced to flee their home countries due to violence and threats on their lives. Juggling 15-18 cases at a time, Nzelibe has seen firsthand the difference that providing support to displaced people can make. Here, she talks about her work with the CFJC and her own immigrant story. Plus, she shares the most memorable moment during her 13 years at the CFJC, and how we can all stand with refugees. According to the UN, each minute 24 people leave everything behind to escape war, persecution, or terror. Why is World Refugee Day such an important day of recognition? There are so many places in the world where people are being displaced due to different forms of violence. In Syria, it’s because of a civil war. But, right in our own backyard, people are being forced to flee due to violence. In Central America, where most of my clients come from, there’s a huge amount of displacement due to conflicts driven by gangs and criminal organizations, and by the inept ways the governments in those countries address those issues. The work you do at the Children and Family Justice Center is not with refugees, but with asylum seekers. Many people don't know the difference. Can you explain it? If you flee your country and come to the United States and ask to be designated a refugee, then you are an asylum seeker. Whereas, people referred to as refugees under our immigration laws have already been determined to have satisfied the refugee definition before they enter the United States. It’s just a matter of whether the person is seeking the status inside the United States or whether they are coming to the U.S. having already been given that status. Can you elaborate on the work you are doing? I primarily represent youth. I prefer the word “youth” to “children,” because when you think of children, you’re probably thinking of, say, 8-year-olds. But most of my clients are 16 or 17 and from Central America. If you are under 18 and enter the United States without a parent or guardian, you are considered an unaccompanied alien child, or a UAC, at the time you cross the border. UACs are transferred to a children’s detention center after apprehension at the border. I represent kids who have been released from those detention centers to places where the Chicago immigration court has jurisdiction—usually Illinois, Indiana, Wisconsin and, to a lesser extent, southwest Michigan. What the CFJC does really well is that we provide holistic representation to our clients. My students and I may have a client who, because of conditions in his home country, didn’t go to school. So not only does he not speak English, but he may not have had any formal education. We may get our social work team involved to try to address some of the school issues. Or we may have a client who has never seen a dentist, either as a result of poverty or violence, so we might try to meet those needs as well. While those issues are being sorted out, we represent the client in immigration court. Many of my clients are seeking asylum because they are afraid of being killed if they return to their home country. These cases are tough to fit within the refugee definition, which I believe was designed to address issues stemming from World War II. But, the nature of violence has changed so much since then. How do these clients find you? Lots of different ways. The various children’s detention centers around the country have my number and email address. Sometimes they’ll call and give me a heads-up about someone who is being released to Chicago or a nearby suburb and ask if I’d be willing to take the case. We also get referrals from the Young Center for Immigrant Children’s Rights at the University of Chicago Law School. Young Center attorneys act as best interest lawyers for the child. This role is slightly different than what we do — we act in the child’s expressed interest, so the child in our scenario is my boss and tells me what to do. The Young Center’s primary role is to make sure that the kids who they represent are provided with services, including legal services. So, they may contact me and say “we have a difficult case would you be the lawyer for the child here?” I also take cases from the National Immigrant Justice Center (NIJC). If, for example, they have a conflict or, for whatever reason, they feel a case would be a good fit for Northwestern Law students, they will refer it to me. And of course, I’ve represented enough clients now that sometimes I have family members of former clients calling me. So how big is your caseload at any given time? I have about 15-18 cases at any given time, but they are all at different stages. Some of these cases last forever. For example, a case that I took in 2005, a year after I started here, lasted until 2014 when we finally got the client asylum. So sometimes, I really get to see my clients grow up. On average, though, I’d say a case takes 3-5 years because the immigration court and asylum office are so backlogged. For children’s cases, it takes about six months to get an interview before the asylum office. During that time, my students and I meet with the child multiple times to learn about his life. Students also do research to corroborate the client’s story. So, they might call Honduras and talk to family members there who might have information, and look for an expert on, say, gangs in Honduras. After the interview, we have to wait for a decision which might take two weeks or eight months. If we lose before the asylum office, the child gets to bring his case anew before the immigration court. Due to horrendous backlogs in the immigration court, a hearing before an immigration judge might take three years. After we get a client asylum, we usually stay with the case until the client gets a green card, which takes a bit longer. All of this adds up. Before you know it, your sixteen-year-old client is now twenty-two. Speaking of the students, what are some other important ways that students working with the clinic get involved in the representation of asylum seekers? The students are on the ground, doing the work. My clinic has a lot of one-on-one contact with the client because for my cases, the client is usually the person with the most knowledge about what happened and bears the burden of convincing an adjudicator that he should be allowed to remain in the United States. So my students spend a lot of time with the client, but they also spend a lot of time doing what I call “creating the universe,” meaning actually going out there to investigate and gather facts. Unlike a legal writing or doctrinal class, I can’t hand a student a write-up of what happened, the students actually have to go figure it out themselves. What makes it interesting, and my students might say challenging, is that everything happened in another country. It’s hard enough to investigate facts when something happened in the United States, or even Chicago, let alone trying to figure out what happened and getting documents or birth certificates from foreign countries. Students are in charge of all of that, and they are also in charge of crafting the legal theories that we try to use to get folks asylum. So at every step of the way students are actively representing their clients. You immigrated from Nigeria as a child, and mentioned in a Northwestern Now podcast last year that you always knew you would do this work. Can you elaborate on your story, and how you knew this was your calling? I was almost seven when I immigrated to the United States. One of my very first memories is of being picked up from the airport, and there were sesame seeds on the bread I was eating. I had never seen sesame seeds, and I remember thinking, What is this? There were so many moments of What is this? during my first year in the United States. Being a child immigrant is also difficult because kids can be brutal. I remember going to school and the other kids would tell me I was from the jungle and I would think, but I know I’m not from the jungle, because there were skyscrapers where I lived. Reconciling how people viewed me as an African immigrant versus how I viewed myself was challenging. But, overall, I was lucky. And with great power comes great responsibility. I love comics, and that Spiderman saying always resonated with me because my parents were able to afford a lawyer to help us navigate the U.S. immigration system. The children I represent cannot afford lawyers and under our laws are not entitled to a free lawyer. Yet, having a lawyer makes all the difference in immigration court. When I graduated from law school, I knew I wanted to help immigrants, especially children fleeing violence who I think are some of the most vulnerable immigrants. What is one thing that you wish more people understood about displaced people and families forced to flee? "If you can’t live in your home because you’re going to get killed, does it really matter why you are going to get killed?" People have an image of what a typical refugee is and, in the United States especially, people view them as coming from faraway places like Syria or Congo. They imagine that people who are worthy of US protection must be fleeing wars or state-sponsored violence. I want people to understand that all people fleeing violence from which they cannot be protected should be worthy of refuge and protection in the United States. Right in our own backyard, there are people being displaced by gang violence. These people are not really that different from the people who are being displaced by war. If you can’t live in your home because you’re going to get killed, does it really matter who is going to kill you or why you are going to get killed? The questions that matter should be: Will you be killed? Can someone protect you? If yes, you will be killed and no, no one can protect you, then I think the U.S. should offer you protection. What has been your most memorable moment in doing this work? A long time ago, I represented a woman from a country in Africa that has had problems outlawing slavery. I had worked with this woman, a former slave, for a really long time, and after we got her asylum I told her she should enroll in ESL and get her GED. She looked at me and said, “No, I just want to be a hair braider.” I was crushed. I wanted so much more for her. I saw helping her to get asylum as the first step, rather than the last step. This interaction caused me to reexamine my role in the lives of my clients. From then on, I would tell myself and my students, your role as a lawyer is simply to serve the client and do what they want you to do. "You don’t know what you are going to say to someone that will push them along a path that they wouldn’t otherwise take." This conversation changed my perspective yet again. Now I think maybe it’s ok to push people. You don’t know what you will say to someone that will flip a switch for them. Many of my clients are at a crossroads in their lives. If my students and I win their case their life can go this way, if we lose their case it could go that way. But they’re also at a crossroads in so many other ways, and you don’t know what you are going to say to someone that will push them along a path they wouldn’t otherwise take. This client’s story also speaks so much to the immigrant story. Oftentimes we see people who come to the United States as such a drain — they are going to come and they are going to take this and they are going to take that. This woman may have started out getting benefits but look at where she is now. Now she’s giving, not taking. We should be proud that we have a country where someone can come and, even with such a tragic background, can make it through and achieve their dreams. Not too many places in the world have that. A current campaign from the UNHCR, the UN Refugee Agency, calls for people to stand #WithRefugees. What are some ways that people – both lawyers and those in the legal community, and also the general public – can show that they stand with refugees? People should continue to voice their concerns about the proposed suspension of the U.S. refugee program. But I also think that people should stand with immigrants generally. Oftentimes people say “we have the good folks and the bad folks, and the good folks are the people who are being persecuted in their country, but the bad folks are the people who are fleeing because of dire economic situations in their country.” The truth of the matter is that everybody wants a better life. And they also want to contribute. Recognizing that is really important.